There is nothing that says more about its creator than the work itself. The human heart itself is impossible to understand. If you focus on the impossibility of truly understanding human psychology and read the script one more time, I think you will grasp the point of it. 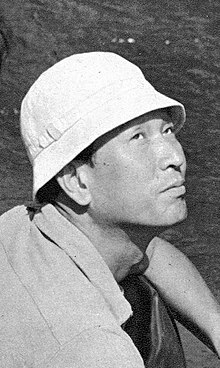 Akira Kurosawa (黒澤 明 Kurosawa Akira, also 黒沢 明) (23 March 1910 – 6 September 1998) was a Japanese film director, producer, and screenwriter. Regarded as one of the most important and influential filmmakers in the history of cinema, Kurosawa directed 30 films in a career spanning 57 years. Human beings are unable to be honest with themselves about themselves. They cannot talk about themselves without embellishing. This script portrays such human beings — the kind who cannot survive without lies to make them feel they are better people than they really are. It even shows this sinful need for flattering falsehood going beyond the grave — even the character who dies cannot give up his lies when he speaks to the living through a medium. Egoism is a sin the human being carries with him from birth; it is the most difficult to redeem. This film is like a strange picture scroll that is unrolled and displayed by the ego. You say that you can’t understand this script at all, but that is because the human heart itself is impossible to understand. If you focus on the impossibility of truly understanding human psychology and read the script one more time, I think you will grasp the point of it. In a mad world, only the mad are sane! I like silent pictures and I always have. They are often so much more beautiful than sound pictures are. Perhaps they had to be. At any rate I wanted to restore some of this beauty. I thought of it, I remember in this way: one of techniques of modern art is simplification, and that I must therefore simplify this film. A film should appeal to sophisticated, profound-thinking people while at the same time entertaining simplistic people. A truly good movie is really enjoyable too. There’s nothing complicated about it. A truly good movie is interesting and easy to understand. Akira Kurosawa as quoted in Kamiski, Michael (2007). The Secret History of Star Wars(PDF). p. 48. Retrieved 2011-01-31. Although human beings are incapable of talking about themselves with total honesty, it is much harder to avoid the truth while pretending to be other people. They often reveal much about themselves in a very straightforward way. I am certain that I did. There is nothing that says more about its creator than the work itself. Ignorance is a kind of insanity in the human animal. People who delight in torturing defenseless children or tiny creatures are in reality insane. The terrible thing is that people who are madmen in private may wear a totally bland and innocent expression in public.